Courtesy of Wikipedia.org. Other variations of this map exist, and may be found online. Recently a patron asked me why he was unable to find information on his ancestors who arrived before the Mayflower. I explained that Plymouth Colony was the first permanently settled colony in New England. What I told him was technically true, but I later discovered that an earlier colony had been established in Maine. During the late sixteenth and early seventeenth centuries, England, France, and Spain all had their eyes on the New World, hoping to take advantage its great wealth of resources. Explorers had visited this area of the Maine coast many times, but the history of what would become known as the Popham or Sagadahoc Colony really began with the voyage of Captain George Weymouth to the mouth of the Kennebec River in 1605. Weymouth scouted the area of the Kennebec, noting the rich forests, fields, and streams strong enough to power mills. Making friends with the natives, he subsequently betrayed them by abducting five of their number and conveying them to England. The arrival in England of Captain Weymouth with his captives created quite a sensation. Sir Ferdinando Gorges, a favorite of the king’s, took three of the Indians into his own home. Sir John Popham, Chief Justice of England, became guardian of the remaining two. After learning the English language, they were able to confirm all that Captain Weymouth reported. It was this information that led the way to the settlements of Jamestown, Sagadahoc, Plymouth, and Massachusetts Bay. Encouraged by their promising accounts, Gorges obtained a grant on 10 April 1606 from King James I for territory in Virginia and all land north to the St. Lawrence River. He enlisted Popham in his scheme and with the support of others arranged for the settlement of two plantations in America. Organizers of the First Colony, which was undertaken by certain noblemen, gentlemen, and merchants in London, sent a ship to southern Virginia, the future Jamestown Colony, on 20 December 1606. In their enthusiasm to establish the Second Colony, Popham and Gorges dispatched a ship to the new world in August of 1606 but it was captured by hostile Spaniards. Undaunted, Popham and Gorges sent two more ships to Maine on 31 May 1607 with 150 men and boys on board which arrived on 8 August. It is said that the first sermon conducted in New England was given shortly after their arrival. It was also claimed that the first ship constructed in New England was built in the Popham Colony and sailed to England a year after its settlement. This claim has since been disputed. In any case, the experiment was an unfortunate failure. A few months after their arrival some of the settlers returned to England. Interestingly, the colony did not experience the severe famine and disease that decimated Jamestown and Plymouth in the first winter. The death of one of their leaders, George Popham, the failure of the colony to be financially self-sufficient, and the harsh winter climate convinced the remaining population to return to England the following year. While in Maine, they did have some successes. They built a fort and managed to ship some sassafras and timber, but the spices they desired and the metals and minerals they expected to mine failed to materialize. As a side note, the actual location of the fort was unknown for more than two hundred years. 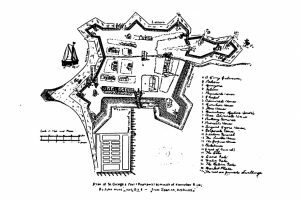 In 1888, a researcher for an American diplomat discovered in a government archive in Madrid a map of the fort drawn by a Popham colonist. Most likely it was taken or copied by a Spanish spy shortly after its arrival in England. Surprisingly, there was little or no interest in the map until 1995. 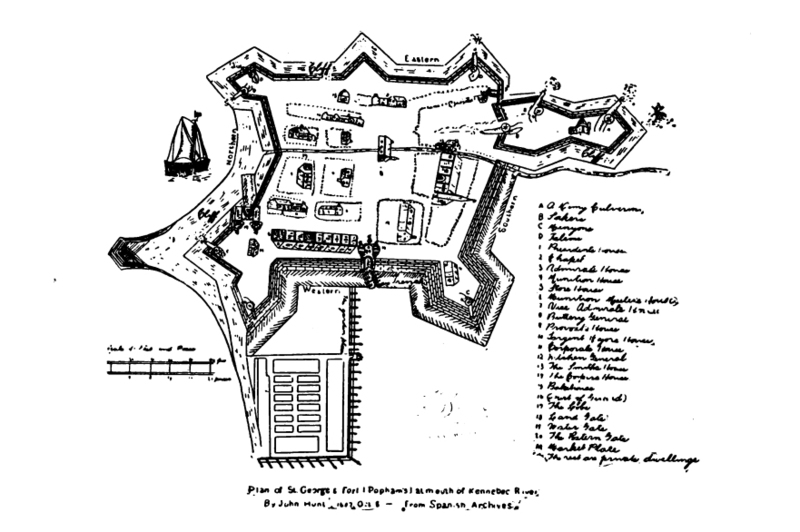 Using the map as a guide, an archaeological dig discovered the fort two years later. My initial interest in Popham was the possibility of another colony in New England preceding Plymouth. However, learning of the role that the Popham Colony played in the establishment of the future settlements in America became an even greater interest to me. Wonderful article…loved all the area in Maine on my very first visit, and on many returns. Oh, and love the history aspect! Another book on Maine history that I found very interesting, is “The Lobster Coast”, by Colin Woodward, 2004. Thank you Carole. I will look for that book at my local library library. Sounds interesting. Thank you! There isn’t a lot written about early settlements in Maine. Another, slightly earlier, colony was established by the French at St. Croix. And, of course, there are the intriguing possibilities of the Goddard Penny. Wow..how fascinating, however a sad note our human tendency to lie and mislead others..sigh. Still, humans are a brave bunch and this was a daunting venture. I can imagine how cold Maine must have been after England! Maine historical and genealogical research starts with James Phinney Baxter’s Documentary History of the State of Maine, volumes 1-24, available physically at the Society (and as odd volumes through various NE booksellers) but also in part through Maine genealogy websites and through archive.org. Baxter’s series is actually a continuation, no. 3 I think, of the Maine Historical Society’s 19th century ambition to thoroughly document in print ANY material on the 1st 100 years of exploration and settlement. A lot on the Popham colony and then the Gorges will be in the 1st series. More documents, of course, have come to light since, the Thomas Gorges Letters being one such item. I can’t tell from Tom’s link to the MHS if its are doing anything with the DHSM online. I have argued that it be turned into a database here as EACH VOLUME has its only really really good index. I mined the Baxter’s last 2 volumes for my master’s thesis on The Pejepscot Proprietors. Truly an over-looked resource for both general New England history as well as for the Maine itself. Many Massachusetts people migrated to Maine just before and just after the Revolution before they or their descendants started heading west. Thank you very much for your comments and your citing the source for the DHSM volumes. Generally, the Society will not digitize works that are in the public domain and available on the internet. What we will often do is provide in our on-line catalog a link to web sites where the books can be read or downloaded. I note that we have not done that in this case and will talk to our technical services department to see if it possible to arrange for this to be done. I agree that this work should be more widely available. I appreciate your bringing this to our attention. Thanks Tom for your response. A few volumes may be up at Maine Memories, but I’m not sure. Certainly, not all of the 3 series are up at archive.org. The 1st 2 are generally less used than even the 3rd series! The MeHS is itself not doing anything with this resource, not even considering reproducing with new material to exert copyright. May I suggest a collaborative outreach from Hist Gen to them? Forgot to mention that Anderson used the 1st 2 series extensively in GMB, as did Noyes et. al. in GDMeNH. It looks like there are quite a few volumes on-line at hathitrust.org but not sure all of them are there. Do the same volume numbers in the different series contain the same content just published in different years or is the content completely different? Tom, Thanks again for spending time with me on this. I used to know this bibliographical info on the various MeHS series cold, but alas. The old Harvard Guide to American History had material laid out all correctly; my edition was one edited by Handlin among others. I do see my error re stating there were 3 series. MeHS published 2 series of “Collections and Proceedings”, one that started before 1869, when the 1st Doc Hist volume was published, and one that ran 1890-99. The Doc Hist was launched in 1869 as Collections, 2nd Series (see end of library listing below). The 1st C&P contains a good deal on early Maine. The 2nd C&P a lot less. With the exception of Baxter as editor and also the publishers, this is how it appears in Anderson GMB III “Key To Titles” XXIV. Anderson also lists separately volume 3 in the Doc Hist as “The Trelawny Papers” on page L, citing it as vol. 3 of Collections 2nd series, but not as part of the Doc Hist, which it was. He made a great deal of use of that volume. From Anderson’s “Key To titles” there is no indication that he made use of anything in the two C&Ps. F16 .M38 Corporate Author	Maine Historical Society. Title	Documentary history of the state of Maine / published by the Maine Historical Society, aided by appropriations from the state. Description	24 v. : ill., maps (part fold.) ; 23-26 cm. Note	Volume 2 published at Cambridge [Mass.]. Half-title: Collections of the Maine historical society. Second series. Not to be confused with the society’s “Collections and proceedings,” 2d ser., v. 1-10, 1890-99. Subject	Maine — History — Sources. Maine — History — Societies, etc. Note	Half title: Collections of the Maine Historical Society. Second series. There is no Hathitrust link at this listing. I would suppose that Anderson consulted vol. 3 The Trelawny Papers at the Society but according to this its either not there or shelved perhaps under Baxter. [And that indeed is the case: Trelawny Papers, F16 .M38 v.3.] My downloaded copy of volume 3 is a typically OCR butchered version uploaded to archive.org from the University of Virginia’s copy, effectively useless without having the real book to hand. Note that in the long listing above Baxter is not credited as editor. This also indicates that the Society might not have all 24 volumes though the last line “Holdings” suggests it does. I know I consulted the last 4 volumes in the series at some point before purchasing about half the set in Maine. (I no longer have any physical copies.) They were at that time all shelved together. Why our Society reprinted volume 10, I have no clue. Of course, MUCH of the material reprinted in the Doc Hist comes from the MASSACHUSETTS ARCHIVES!!! Baxter employed copyists who carefully proofed their transcriptions. I can attest to that as I initially worked off of microfilm of the original Pejepscot Proprietors papers held at MeHS itself. My summations and printouts matched what I saw printed in Doc Hist. The Society’s bibliographic listing in the Library catalog should really contain line listings for each volume. I suspect that if I made a request at the 7th floor for F16 .M38 volumes 21 and 22, they’d be found pronto. So, if you can’t readily find the volumes, how can one figure out what they contain? At the very least, online access to the indexes in each volume would be very useful. I have seen at least one claim in a history of some Ohio town that their Scammons descended from John Scammon, Secretary of the Popham Colony. Are there any other men of that colony who left descendants that eventually settled in America? The Scammons are said to have come from Barbados, so I would think that after Popham, England was not their final destination. Anderson has no listing for John Scammon in GMD, nor does the name appear in the index to the 1st 3 volumes, GMB. If relevant work has been done on Humphrey’s ancestry since GDMNH came out in the 1920s, you’ll have to check the Society’s library catalog, contact the Maine Historical Society & search their catalog as well, and do a general Google search as a “get-started” action step. Quite lot of work has been done on the ancestry of the Scammons but it would not be relevant since it does not appear in any catalog. That Humphrey is related to John of the Saffin will is pure conjecture, and is rejected by the earliest American genealogists. No one as of yet has explained Farmer’s Register entry for William Scammon at Boston in 1640. That Anderson does not include a “William Scammon of Boston in 1640” in his Great Migration Directory indicates that he considers some part of that Name/Place/Year phrase to be wrong regarding such a person in such a place “in 1640”. His reasons for doing so are not published anywhere, to my knowledge and, given the non-work going on at present on the 1636-1640 migrants, unlikely to be published in our life times. Of course, you could inquire about this directly with him and see what he says. I wanted to let you know that I looked into online options for accessing The Documentary History of the State of Maine, and it looks like all 24 volumes are currently available on HathiTrust at http://catalog.hathitrust.org/Record/010116921. I’ve added a link for the HathiTrust version to our catalog record and it should be accessible now. I’ve also confirmed that our Rare Book Collection does indeed contain all 24 volumes of the Documentary History. From the catalog record (http://library.nehgs.org/record=b1087532~S0), you can see the listing for each individual volume by clicking on the button labeled “View additional copies or search for a specific volume copy”, immediately below the listing for the first 11 volumes (above the Description field). And I’ve made an added entry to the catalog record for Baxter as an editor. Thank for bringing this omission to our attention! I wanted to let you know that I looked into online options for accessing The Documentary History of the State of Maine, and it looks like all 24 volumes are currently available on HathiTrust at http://catalog.hathitrust.org/Record/009965420. I’ve added a link for the HathiTrust version to our catalog record and it should be accessible now. I’ve also confirmed that our Rare Book Collection does indeed contain all 24 volumes of the Documentary History. From the catalog record (http://library.nehgs.org/record=b1087532), you can see the listing for each individual volume by clicking on the button labeled “View additional copies or search for a specific volume copy”, immediately below the listing for the first 11 volumes (above the Description field). Another illness caused me to miss your post the week before last. THANK YOU for the links and corrections. The Hathi Trust pdf is clear as bell. Do “we” only have download capability physically at the Society, or would I have to “join” separately to do so? I am nowhere’s near getting back to that project, alas, but it is a relief to know I can “put my hands” on those volumes, especially the indexes, when I can. 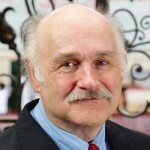 Also, thanks re adding in James P. Baxter’s name as editor. It is a bit confusing in that the Doc Hy launched and then stopped under the editorship of MeHS executive directors before Baxter picked it up for good around volume 4 or 5. And even he ran out of time and personal energy, the project falling short of his proposed 1820 end date. He is a fine historian of early Maine (see other catalog listings), trained in documents under David Pulsifer, and, yes, is part of the Baxter family responsible for Baxter State Park. And, of course, was a member of this Society as well.